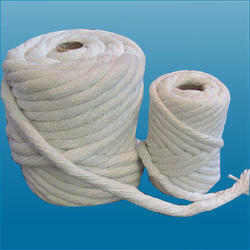 Prominent & Leading Manufacturer from Mumbai, we offer ceramic fiber rope and ceramic rope. 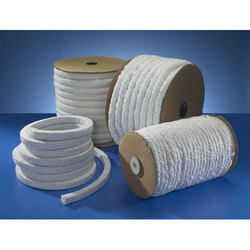 Ceramic Fiber Rope is a compression packing for very high temperature duties. It is manufactured from an exceptionally stable fibre material that is soft, non-irritating, non-hazardous & is not limited by World Health Organisation or European Union restrictions. These heat resistant fibres are produced using advanced chemical fibre technology. They are spun into a flexible yarn, together with a low percentage of glass fibre and Inconel wire reinforcement. It contains no organic agents or processing additives. It therefore retains its physical and chemical properties at very high temperatures and does not decompose into hazardous substances, as happens with many normal ceramics. We are offering Ceramic Rope.